Put Qpop and RepairQ to work. 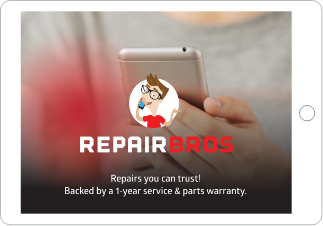 Using RepairQ with Qpop simplifies your customer interactions. Don’t wait any longer, sign up today! Qpop is a customer facing point-of-purchase companion tablet app that will instantly enhance your service counter experience. Qpop enhances the point-of-purchase experience during customer intake and checkout for retail, buy/trade, repair, or service business models by instantly engaging your customers, supporting your sales process, and collecting customer feedback. Best of all, Qpop is conveniently built on standard web technologies and networked to sync with RepairQ, allowing you to utilize this companion app on most iOS and Android tablets! Qpop can be loaded with promotional content including images or videos for use during unique points of customer interaction! While Qpop is idle, it can rotate full-frame advertisements. During specific customer interactions, Qpop adds sidebars for ad placement supporting last minute offers and up sells. 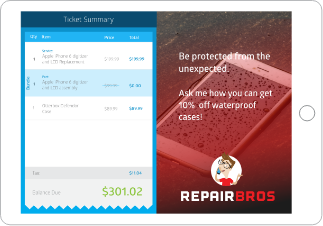 Customers can review retail, repair, service and trade details as you create their tickets. The Qpop ticket view provides a list of sale items with payments, price & totals; helping increase customer trust through transparency as well as supporting service authorization. In retail repair and service, customer authorizations are essential for collection consent to service work, price, disclaimers and warranties. Qpop provides retailers the means to present that language and capture an electronic signature for record on file. 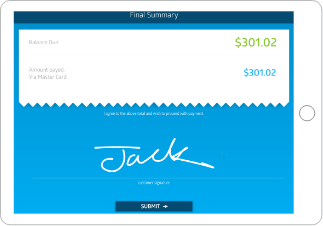 Retailers using an integrated credit card processing can go 100% paperless by including an electronic signature request on Qpop for credit card payment authorizations. Experience the power of RepairQ and Qpop with a free live demo. Your customers will be able to see their contact information and verify that it has been entered correctly into the system. Your customers will be able to enter their passlock codes or patterns directly into Qpop for electronic storage & recall. 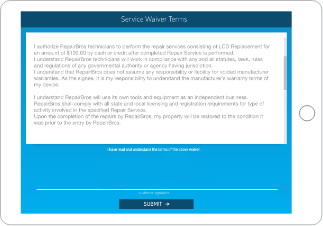 Retailers using RepairQ’s Warranty Sales integration will be able to extend Warranty Sales offers to customers on a new Qpop screen. Allow your customers to select whether they would like their receipt as a physical copy or emailed to them.